The OnePlus 6T’s alleged retail box surfaced a couple of days ago, and the device’s render has just surfaced as well. This phone seems to be running HydrogenOS, which means it is probably a Chinese version of the OnePlus 6T. Now, some of you will notice that the volume rocker buttons and an alert slider are not visible in an image of the phone’s front side, which is odd, but the alert slider is visible in an image which shows the back side of the phone… both are presented in a single picture you can check out above this article. The missing alert slider and volume rocker buttons on the front side of the button either signalize that this is a fake render, or it could simply mean that they’re not shown for whatever reason. Whatever the case may be, the power / lock button and an alert slider will almost certainly be located on the right-hand side of the OnePlus 6T, while the volume up and volume down buttons will be on the left, along with a SIM card tray. The OnePlus 6T will almost certainly resemble the device shown in this leak, as it will closely resemble the OPPO R17 Pro. 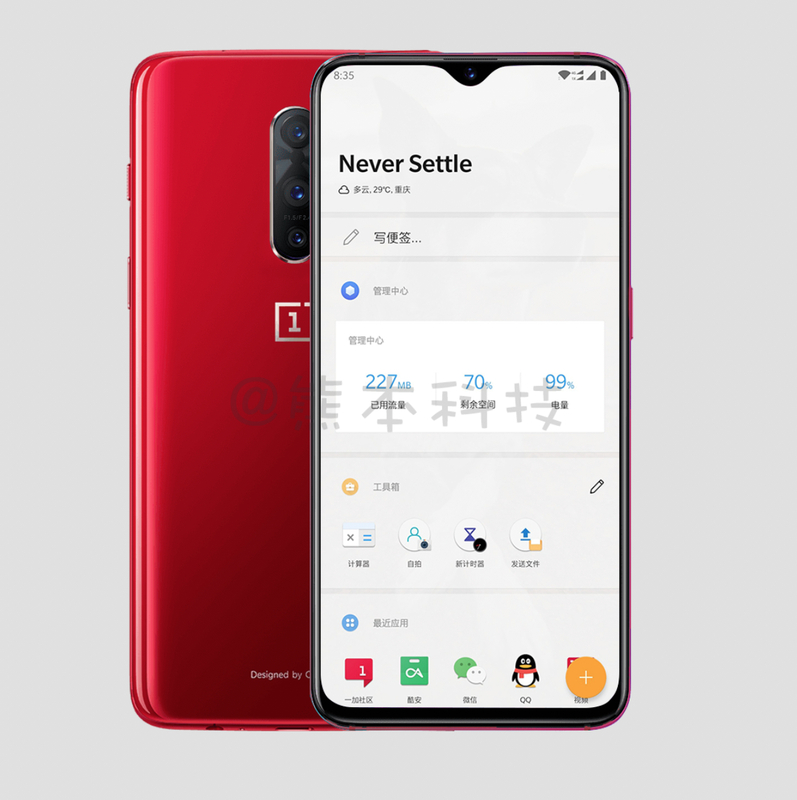 This seems to be a Red variant of the OnePlus 6T, and as you can see, the phone is made out of metal and glass. The ‘Designer by OnePlus’ branding is included on the back of the phone, along with OnePlus’ logo. You will notice that this phone sports a water drop notch at the top, which is quite small, and it seems to be identical to the one on the OPPO R17 and R17 Pro. A front-facing camera is placed on the inside of that notch, while an earpiece is located on top of it. The phone’s display is curved, while bezels are almost non-existent, even though the device does sport a really thin bezel below the display. A fingerprint scanner is not visible on the device, which probably means that it is located below the display, while you will notice there are three cameras included on the back of this phone, and they’re vertically aligned. The OnePlus 6T will probably sport a similar rear-facing camera setup to the OPPO R17 Pro, which means we’re looking at a 12-megapixel camera with a variable aperture (f/1.5-f/2.4) and OIS, 20-megapixel camera with f/2.6 aperture, and a TOF 3D camera. The OnePlus 6T is expected to arrive before the end of 2018, quite probably in November.